Huzzah! One last race to write about for my winter race season. It’s been a very busy February, with 6 races in the past 5 weeks! With all the racing, I hardly had time to update my website, as a result of all the videos that I had to put together, coupled with the training I had to to do prepare for those races! Luckily for me, I have a little bit of a breather now. In fact, I have no events on the calendar at the moment until the first weekend of May. Of course, in the meantime, I’ll be keeping busy with wedding planning, and a little road trip to Las Vegas for my bachelor party! But of course, that’ll not be blogged about. However, the Mad Trapper Finale of 2013 will be! And if you are here reading this, you came to the right place. No re-cap video this time, but plenty of pictures for you to check out! Once you’ve had a look, read on for the story of this challenging final race! 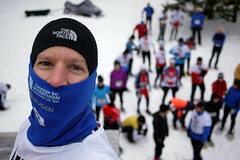 Although the Mad Trapper Snowshoe race series started with a bit of a hiccup in December (remember the trail run that we had? ), the subsequent 3 races were absolute treats as far as snow cover went. It seems as just before every race, we had a nice big dump of snow a few days before, forcing race director Mike to head out and to some serious trail setting. The finale was no different in that respect. Whereas most years, you can count on a ‘flatter’ course, a ‘hilly’ course, a ‘night’ course, and the ‘finale’ being a combination, this year, it seemed every race was a whole new course for us. Sure, there were some common trails from past years, but by and large, these were new inventions of Mikes. For this particular race, Mike apparently pulled out all the stops and decided to put together an incredibly challenging course for all, just so that when you crossed that finish line, you KNEW you had accomplished something! The picture above pretty much says it all. I was pushing in zone 5 the whole way (well, about 80% of the time according to the raw numbers. My average HR was 169, and my max was 191. We covered almost 11km, and that took me a total of about 1hr20mins. The numbers are actually a little off, as I forgot to hit stop at the finish, but rather pressed lap, so really it was 90% zone 5, and all other numbers higher! But of course, numbers only tell some of the story. The real story is in the experience itself, and the competition that I was racing against. Happily, my performance against my betters was quite strong, and the course, although painful, was also quite beautiful. Mike himself was out on the course at a few spots to not only cheer people on, but to also secretly laugh as we suffered in spots that we’d have to climb up steep sections, only to come barelling right back down again, and then have to head back off on an uphill slog. I’m not quite sure how it was possible, but it felt like we spent most of the race going uphill rather than flat or downhill sections. Of course, given the lower speed when you climb, and the grades we were faced with, that makes sense. For the finale, there were about 55 participants finishing the course, split between the 5k and 10k courses. Looking at the results, there were 33 racers in the 5k, split pretty evenly between males and females, and 22 racers in the 10k, with only 5 females. However, there were more racers that actually started than finished. I know this for a fact because 2 of the toughest 10k competitors both dropped out after the first lap and officially DNFd! Who are these characters? Well, for starters, Dave McMahon, who had been having stomach issues, and the other was none other than Nick Best, the fellow who actually won the NCM 1/2 marathon, and placed 2nd at the Army ½ as well. Yup, he’s that fast and talented! What does that all mean for my race? Well, looking at the names of those who did beat me, I can safely say I feel pretty damn good about it. When the race was officially started at 10am, I found myself sitting probably around 10th place, which I wasn’t too enthused about, but knew that after the first couple climbs, I’d likely claw past a few people who started a little too enthusiastically. I’ve done enough of these to know my pacing. So I stuck to a hard, but steady pace, soon finding myself behind Natasha Elliott, the ALWAYS victorious female, and a person whom I usually have a very good battle with out there. I had just beaten here on the first 2 courses, and she had just beaten me in the night course, so I know staying with her would be a good pacing plan. However, after about a kilometer with her, I felt like I had a bit more to give, and decided to make my move and pass her. James Galipeau followed me, and we steadily made our way forward, opening up a little gap as we huffed and puffed. Not long after, we caught sight of both Dave McMahon and Rob Lefebvre, another speed demon out there. They had been gapped by the lead pack and were running together. Sure enough, James and I closed in on them (no easy feat). When we finally did catch up, Dave encouraged us to pass them and keep pushing, to hold off any others coming behind. The encouragement was good, but also seemed foolish in retrospect. Buoyed by this, James and I made the pass, and tried to pull away, however, it just felt as though it had forced us to push even harder, and the terrain was NOT easy! After a few more km, we did managed to open a small gap, and by then, James was apparently feeling even better than I, as on a particularly nasty steep incline, he offered to take over the lead and break trail. I agreed, and once he got past me, I simply could not stay with him. He seemed a man possessed. We had seen others in the distance, but the gap was not one I thought we could bridge, so I was happy to just keep others at bay behind us. 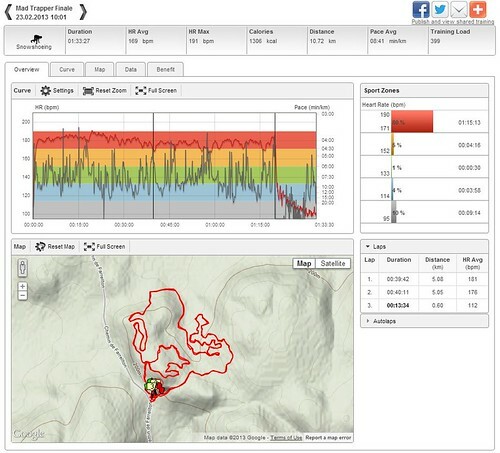 I should note that all this was during the first of two loops, and probably around the 3.5-4k mark at that! There was still a lot of racing to do. It was clear to me there would be NO easing up, as I knew both Rob and Natasha would be gunning for me. Lucky for me, I had the motivation and drive today. I wanted to push hard and leave it all out there. I was not lugging any cameras and did not have to get any pretty footage. I could turn myself inside out for this final race, knowing that I would have the following weeks to finally recover from a hard month of racing. So I did just that. I pushed till I ran out of steam, then told myself to push again, and harder, as otherwise I’d be caught out. I really wanted to catch back up to James, but that wasn’t going to happen. Somewhere midway through lap 2 I found a 4th wind, and kicked up my pace again, and managed to start closing on James, probably reeling back about 45 seconds, but it was all for naught. He ended up crossing the line 40s before me. In turn, I beat Rob to the line by a mere 34s. Turns out he was being chased hard, with the next fellow only 6s after that!! All in all, I had a great race. I knew I was in for a rough ride when at the 1k mark, I was already tasting blood in my throat. However, the engine was running smoothly and the body did not resist my pushing. I’m extremely happy with how things finished. Particularly considering the cast of characters that beat me. If you scan the names, they are the who’s who of top runners, cyclists, triathletes, skiers of the region, and finishing 6th in that crew was a great accomplishment and rewarding way to cap my season off. Of course, as usual, the real fun only started after crossing the line. I cheered my fellow competitors in the warmth of the ARK with a nice cold beer compliments of the Broadhead Beer Company. My beer of choice? A tasty pale ale known as ‘Underdog’. How fitting, given how I feel in these races 🙂 I also scarfed down 3 delicious chocolate brownies, and enjoyed helpings of both the delicious soup and chips that were on offer. All this while socializing with all the other racers, and Mike giving out all the prizing from his generous sponsors. I walked away empty-handed, but smiling nonetheless. I’ve long stopped racing for any sort of prize I think. It’s all about the experience, and this was another Grade A experience! So, what do you do after a hard race like this? Well if you’re me, you have plans with friends. Including a nice cross-country ski in the parc, and putting a traditionally Swiss raclette for supper afterwards. The wine and board games went over stunningly well, and when I finally turned in for the night, I did so knowing I had a pretty much perfect day. Lots of playing outdoors, time spent with friends and loved ones, and enjoying great food together! Yup, this sort of day makes a 5-day stretch in a cubicle all vanish from my mind. If you haven’t gotten out a lot this winter, the best is yet to come with piles of snow and milder temps. Do your mind a favour, and head out there!! That’s it for me for now, and I’ll be quiet for the next little bit as I focus on spring training and making sure wedding plans are well at hand before the summer race season! Hope to see you all out on the trails though.